Tuesday February 2nd 1926 Wrote to Hattie again to send Cal Forneys letter. I went down town early. Bought an umbrella and went to Ediths. Came home in the rain. Letters from Hattie, Mrs Maxfield down in De Land and some papers. Wednesday February 3rd 1926 Went down town for lunch. Wrote Ott & Fannie. I then attended The Opera of "Thias." Went to the office. Maime did not come so Ott and I came home by car. Thursday February 4th 1926 Wrote Lizzie Lindley and Lydia in AM. Left at eleven for the city. Had lunch and went to Hollywood to see "The Big Parade" at the Egyptian Theater. It is beyond description. Had supper before coming home. Ott on the same car. I had a letter from Sophia Woolf. Friday February 5th 1926 It is two months today since Edith and I got here. I wrote Millie Byington and Mrs Falk in forenoon. Went down town was at the doctor and I do not need to poultice my nose any more. It is four weeks today since I began. Maime came for us. Supper at home. 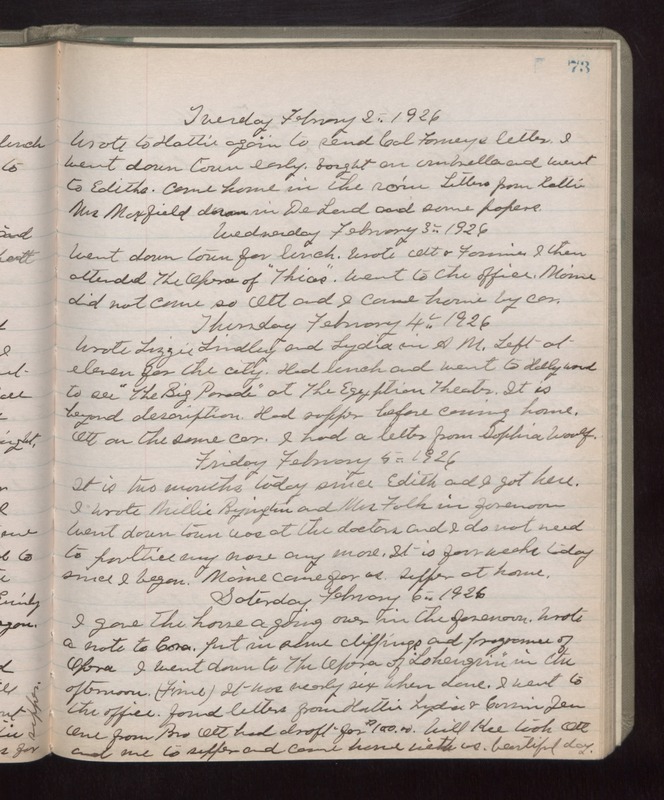 Saturday February 6th 1926 I gave the house a going over in the forenoon. Wrote a note to Cora, put in some clippings and programs of Opera. I went down to The Opera of "Lohengrin" in the afternoon (Fine). It was nearly six when done. I went to the office, found letters from Hattie, Lydia & Cousin Jen. One from Bro Ott had draft for $100.00. Will Kee took Ott and me to supper and came home with us. beautiful day.